← April 2018: All eyes on Asia. And, if you start today, and manage to go ‘all in’ with the full £20k allowance into low-fee equities (in a Stocks & Shares ISA, obvs) every year, even assuming no change in the annual ISA allowance, with average returns of 7% per year it would take around 15 years to reach £500k (or a couple to reach £1m), and a further 7 years to reach the cool £1m mark. Where are all the ISA investors’ yachts? Maxxed out their allowance for thirty years. Thus, be at least 50 years old. Not withdrawn anything. Thus, still be working and/or have other investments / income streams. Invested everything in equities (or something even better). No major asset class matches equity for long term returns except, in some situations, property. But you can’t invest in property from an ISA. Paid low fees. John Lee, for instance, manages his investments himself and is a long term investor, so he has bare minimum fees to pay. Achieved at least market performance. This needs either luck or skill. In any case, it almost certainly won’t happen for a sustained period if a third party is managing the funds. And it won’t, by and large, happen in a Cash ISA either – Stocks & Shares ISAs are a must. This sounds like thousands of people, not millions. Evidently Hargreaves Lansdown – the UK’s biggest financial platform, by some distance – had 168 ISA millionaires last month, up from 12 in 2012. AJ Bell had “almost twenty”. Fidelity probably has somewhere in between. 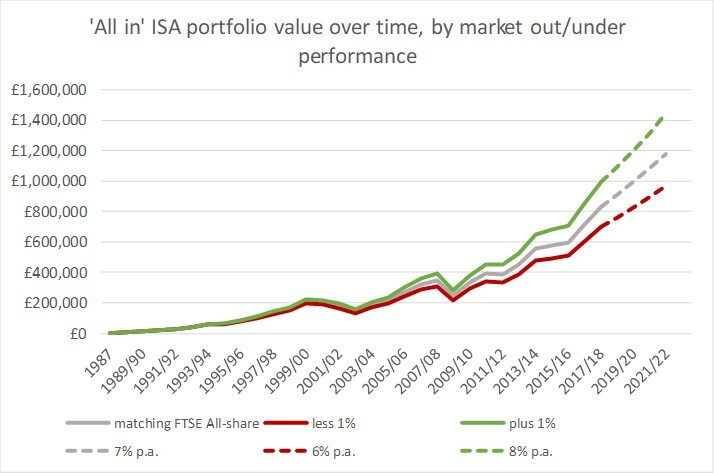 Interactive Investor, which is old by online standards but was only created around the same time as ISAs in 1998, doesn’t publicly talk about having any. In total, it looks to me as if there are fewer than 500 ISA millionaires currently. Incidentally, you do have to admire the chutzpah of Hargreaves Lansdown’s PR team: it’s wonderful framing by them to highlight “look at the funds our ISA millionaires own”, instead of “watch how much easier it is to become an ISA millionaire if you don’t use Hargreaves Lansdown to invest in funds”, and the numbskull financial press laps it up. The reality is that your best way to become an ISA millionaire, starting from scratch today, would be to go ‘all in’ to something like VWRL, Vanguard’s World Equities ETF – you read it here first. I am almost surprised that Hargreaves has any ISA millionaires at all, such are their fees. But while the smarter money will mostly avoid Hargreaves, I suspect that Hargreaves outperforms on the wealthy money. No matter how smart you are, if you haven’t been topping your ISA up by at least £7k per year for 20+ years you have practically no chance of being an ISA millionaire today. My hunch is that HL has a high market share of the demographic who have had this sort of money for that long. And for their ‘let the experts do it’ brigade, if they lucked out by over-allocating to Neil Woodford, Anthony Bolton or similar, then they may have outperformed for a decade or more. Such a shame such funds can’t keep it up for longer. My analysis assumes equities means UK FTSE stocks, and I’ve used the FTSE All Share index as the benchmark. In practice wiser investors would have a more global allocation than that, but that wasn’t easy to do in the 1980s/1990s. Going forward new money would typically be allocated across more than just the UK equity market. In the meantime, Hargreaves has “hundreds” of investors with £500k+ in their pots. I’m not quite at that level yet myself, as I started late (doh!) and have been achieving roughly market average returns. Within five years, even an average investor in UK equities who’s been paying 1% a year, will likely reach £1m just by remaining fully invested. And if you’re ‘all in’ these days, you’re moving £20k a year into your ISA. Pretty soon, there will be a lot more ISA millionaires. How much longer will the tax break last at that point? Buy now while (ISA) stocks last. It’s a good question, how long will ISA’s last. No sensible Tory would cut the allowance, but who knows what the future holds and when things will change. I’d love to be an ISA millionaire, but sadly have emptied mine out over the years to buy houses before I learned about investing. Just into six figure ISA territory now, which I think is cool enough. I know your too old for one, but what do you think about the lifetime ISAs? They are seemingly being overlooked by the UK fire scene, possibly due to the fact you can’t touch them till 60, so it doesn’t quite fit with the RE side of things. @MsZiYou no one of any colour will touch the ISA legislation I think. You and I both know Corbyn and his kids probably have maxed out stocks and shares ISA’s!! Maybe even an offshore property company! Remember both sides of the house have “more in common than that which divides us”. But the political establishment have very little in common with the people they represent, hence we have brexshit. ISAs are a nice little legal tax avoidance scheme for the Westminster cartel…they would never touch them! IMHO. Yes sorry I totally omitted the LISAs. As you say I don’t (quite) qualify for them. But in general terms I gather they aren’t doing that well. And I feel that they are a gimmick which cost you more, in terms of flexibility, than the supposed benefits. I think Stocks & Shares ISAs have pretty excellent flexibility – you can withdraw at any time without penalty – so apart from some very specific scenarios I suspect LISAs lose out in comparison. Personally re legislation I am not as cynical as you. I can even see the Tories tightening the limits because after all Osborne only loosened them recently and in general Hammond doesn’t seem too keen to keep the Osborne gimmicks e.g. the dividend allowance. I think a better policy would be to offer some form of lifetime total allowance. Ideally this would be based on contributions, not size of pot, which doesn’t penalise success and is much easier to make long-term decisions around. But I don’t trust politics to Do The Right Thing, sadly. Oh I agree that the limits may be tightened, but I don’t see the ISA disappearing as maybe MsZiYou suggested. I wonder what % of ISA subscriptions go into UK listed securities. Is this enough volume to fuel market growth? In contrast to what you said here or somewhere else, there are now BTL ISA ready unit trusts (Mill residential I believe) so does this relaxation of S&S ISAs encourage the people of the U.K. to either fuel economic growth, prop up the housing market through raising capital and/or “owning the world” like we used to in the days of empire. Would we be a happier, more prosperous country if every single one of us maxed out our ISAs, reaped in the dividends and “owned the world” like Andrew Craig suggests in his book? Yeah, I agree, a more centrist Tory could easily reduce the allowance and I think the socialists are real. No doubt bureaucratically incompetent, but they will target “perks” that only benefit high earners. And LISA’s seem pointless, they add so much more complexity and penalties that it’s hard to find someone what they’d really suit. We are filling our LISA limit partly as a long term strategy rather than SIPPs. Tax back now and tax free income down the line? Seems win win. So I have to wait two extra years verses our SIPP….oh well. You think we are making a mistake? Good analysis particularly about what it would have taken to get to ISA millionaire status. As an example, I have been investing the full allowance since 2002 and my spouse since 2003. We now have £700K odd ISAed with an IRR of just about 10% pa over this time. It would have taken real investment skill to hit a million in this timeframe especially as this period of 15 year has involved a brutal bear market and a number of more standard stock market corrections. Based on this I’d say 8-10% is a fair long term rate to model for a long term performance of a globally allocated portfolio. I’ve got to £1/3m in my 30 years using TESSAs/ISAs, but there were 2 years when I was abroad, and many when I only used the cash side. Always fun to read – and I also dream of being an ISA millionaire (regularly!). It is only in more recent years that I have been able to really focus on forcing up my (and now my other half’s) contributions. It is a great way to build up – as you say outside of fees. Main thing is put as much as you can each year and see how you do. So far I think only once in the last 5 years I haven’t beaten the FTSE-100 – but for now Ill keep the Go T’ Pub going into VWRL as it is, and see if I can keep beating it. I really can’t wait to see my ISAs hit the 7 figures…..
Really interesting post FvL. I’m filing up my ISA each year – I’d also love to be an ISA millionaire one day. Although I obviously have a far fewer years. Mumma YFG has been filing up her ISA for longer and is doing very well. Just wanted to add that HL is pretty good if you only own ETFs/VWRL – fees are capped at £45. @YFG – many thanks for the comment, and I’m glad you enjoyed the post. I must admit I didn’t realise HL is capped at £45 on ETFs. But I take that with slight pinch of salt because they are going to bombard you with fund marketing, for which I think the fees are commensurately higher. But in fairness I accept I may be a bit prejudiced. I have an ISA with them and have Vanguard ETFs and a couple of individual stocks. Fees are capped and services is great. They only charge a percentage platform fee for holding funds, which you don’t have to buy (regardless of marketing). I wasn’t convinced the new £20K ISA annual allowance was a good thing for me, even thoughI can use it in full, each year. I have enjoyed stellar ISA returns (from distressed debt) and my biggest concern from a regulatory perspective is that they introduce a lifetime limit (on the balance) at some stage. Indeed, I have positioned things such that if the change is signposted, I may use the flexible ISA withdrawal rules to drawdown the lot before a budget, then repatriate if they don’t introduce it. The advantage, of course, is that if they do introduce something, I have the option (but not the obligation) of starting with a zero ISA balance or a large ISA balance, based on whether I repatriate the ISA funds I withdrew in the same tax year. As an aside, the flexible ISA provisions are a massive benefit if you want to break a housing chain. You withdraw the ISA in April, buy new place in May, you then have 11 months to sell your old property and then repatriate back into the ISA. Many investors who have more than £1M in ISAs will have more than one ISA manager and therefore be, quite deliberately, under the radar. It makes a lot of sense, especially for diversification and risk purposes – who is to say that if a broker gets into trouble, there may not be problems with client funds (MF Global comes immediately to mind). I operate my SIPP with a full service provider and can then have a set of stock broker accounts under the one SIPP, which is very useful given how painful pension transfers are since I can transfer cash between the stockbroker accounts staying within the pension, quickly and easily. I’m looking for a similar facility with an ISA manager. Ideally, I want an ISA manager who allows multiple stockbroker provider accounts under the single ISA account. Maybe someone reading this will know if such a thing exists? I also suspect many other ISA millionaires will ensure they are with providers who don’t indulge in self-promotion by publicly lauding the number of ISA millionaires they have. They will be acutely aware of just what a massive benefit it is and such self-promotion by providers is not helpful. I’m aware of one small specialist stock broker (I don’t use them) that had at least 10 a few years ago. At a guess, this was probably from less than 2000 private clients. The biggest ISA balance they had at the time was around £3M – circa 2014, if I remember correctly. But this is very unlikely to happen for practical reasons. There has been no requirement for ISA managers to retain a contribution schedule. There is a requirement to submit annual returns to HMRC, who then in turn check by National Insurance Number to ensure no-one is subscribing with multiple ISA managers and exceeding the combined £20,000 allowance per individual, per tax year. But my understanding (although not verified) is that this data has not been retained historically. If this is true, it would be really difficult from a practical perspective to introduce a lifetime ISA contribution allowance, unless they started everyone from 0 on the implementation date. That probably has ‘fairness’ issues to address. I would expect there would be a high correlation between those with high ISA balances and those who would then (and quickly at that) use up the lifetime ISA contribution allowance. It does beg the question, how much does the AAT ISA working group actually know about ISAs? It must be a bit embarassing to publish what they did, without realising it is impossible to deliver because no-one has retained a historic contribution schedule! Its always best to have a bit of everything for tax purposes, so you aren’t targeted by a particular change. Diversity of investment vehicles is essential. As is the ability to exercise optionality within investment vehicles to give yourself plenty of choices in terms of reacting to changes. The elephant in the room is that the government has literally no clue as to what tax relief has been obtained by any individual on the way into any pension. Some will have 20% (or even lower), I will probably have averaged – over all contributions, something like 50%. So yes, exactly the same applies to pensions. All the Treasury have to work with are individual balances for Defined Contribution schemes and the level (and increase in level) of the Defined Benefit for Defined Benefit Schemes. That is it. Same for ISAs, they can only collate individual balances (across a range of providers) by National Insurance number. Once you understand that, you can see why the Lifetime Allowance came into existence as it was probably the only option (other than changing a flat 30% of relief on A-day back in 2006). (1) the optimal set-up is an ISA provider allowing one to charge dealing costs *outside* the ISA, hence maximizing tax-free capital for compounding. (2) He is an advocate of DIY active management — picking one’s own stocks. Suspect he has outperformed the market by several % per annum, and that this would have been a significant driver of his ISA balance – reportedly ~GBP5m in early 2016! Thank you! I confess I haven’t read the book, just some of his articles. But his point around isa fees is a good one, and thanks to him I agreed with Selftrade to take my ISA fees out of my taxable account. A quick back-of-fag-packet calculation suggests that, unless I am missing something, he must have outperformed by 10% per year over 30 years to get to ~£5m by early 2016! Good for him, if true. I am a John Lee fan and love his writings — and have been fortunate enough to meet him a couple of times in real-life, too. I think he’s very inspiring. From memory he has beaten the All-Share substantially. However someone did a ‘debunk John Lee’ calculation I saw a few years ago where (from memory) he’d underperformed by some margin the small cap index that tracks the sort of companies he invests in. Now whether you can track that index in the UK is another matter (I believe you can’t, although someone did try to float a synthetic ETN a while ago to do so). You can use small cap funds but then you have the selection/fee issues. @monevator and @FVL make intriguing points! Combining them: if a well chosen selection of small caps *can* beat the overall index by a considerable margin (even if it lags the small cap index) then is DIY-small-cap the way to go…? There is a huge likely tax sting in the tail for those accumulating £1m+ in their ISA Portfolio and that is that the accumulated value will be subject to Inheritance Tax (IHT) – unless invested in an AIM ISA, if you are prepared to take significantly higher investment risk). It is reasonable to suggest that those accumulating £1m+ in their ISA Portfolio are likely to have net assets above their Nil Rate Band (& Residence Nil-Rate Band, if applicable), so on death the ISA is likely to be worth 40% less immediately once IHT is deducted – a not so tax efficient savings vehicle after all!! I’ve seen many ISA Portfolios above £500,000, where the individual’s intention is to keep maximising their ISA allowance each year, but nobody has ever discussed the Inheritance Tax implications of continuing to do so with them. Many have built up such significant ISA Portfolios to provide themselves with a tax-free income stream in retirement, but in my experience a lot of these people are the last generation of generous final salary scheme members. who have very good (often index-linked) pension income, therefore rarely ever draw ‘income’ from their ISA Portfolio. Some are, understandably, concerned about the potential cost of residential care and therefore wish to retain money in ISA’s to help fund care costs, without considering that once they are at that stage, all of their income will be being used to pay for their care costs (they won’t be paying for utility bills, shopping and all the other things it takes to keep a household going), so are unlikely to ever exhaust a £1m+ ISA portfolio paying for care. According to the National Care Planning Council, the average stay in a residential care home is 2.2 years, leaving the balance in the ISA subject to Inheritance Tax.